Read the instructions posted on this page to learn how to access the official Shoe Department job application (online version). Numerous current openings can be applied for by creating an online account and going through the application process. The instructions posted below detail how to create an account, search for current openings, and fill out/submit an application. About the Company: Shoe Department is an American chain of footwear stores based out of Concord, North Carolina. The company is owned/operated by Shoe Show. Shoe Show has four retail divisions and more than 1,000 retail locations throughout the United States. The company was founded in 1960. Step 1 – At this time the company does not offer an online application form on its official website. However you can still search/apply for current openings via third party websites such as CareerBuilder.com or Indeed. Follow the steps posted in this guide to learn how to find retail locations in your area, search for current openings, and submit an online application. Step 2 – Go to the company’s homepage (click this link). Note: The above link will open in a new browser window/tab. Step 3 – Scroll down the page and press the “Find a Store” link (as outlined in red in the below screenshot). Step 4 – Choose a State from the drop-down list or enter your zip/postal code into the input field. 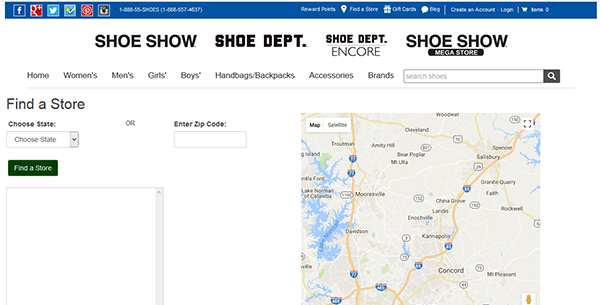 Press the “Find a Store” button to view the list of stores in your area. Step 5 – Store details will be displayed below the search form. If you’re interested in seeing if a location near you is currently hiring it’s recommended to contact the store and ask to speak to the manager regarding current openings. Step 6 – If the store is hiring you will be asked to come in to fill out an application/perform an interview.